FinancialSpreads.com has added two new differential markets to make it simpler and more cost effective for investors to trade the relative performance of the global stock markets. The new markets offer a convenient way for investors to trade the relative performance of the American and German stock markets as well as the relative performance of the German and French stock markets. The Wall Street index is an index of 30 leading US firms. The Germany 30 and France 40 are indices of the top 30 German and top 40 French firms respectively. Differential markets offer a convenient way for investors to trade the relative performance of different markets. A differential market is simply based on the difference between two markets. If an investor thinks that the US stock market will perform better than the German stock market they could spread bet on the 'Wall Street - Germany 30 differential' to increase. Likewise, if they thought the German index would outperform its American counterpart, then they could spread bet on the differential to decrease. For example, if the Wall Street index is at 15747 and the Germany 30 index is at 9312.3 then the difference is 6434.7. 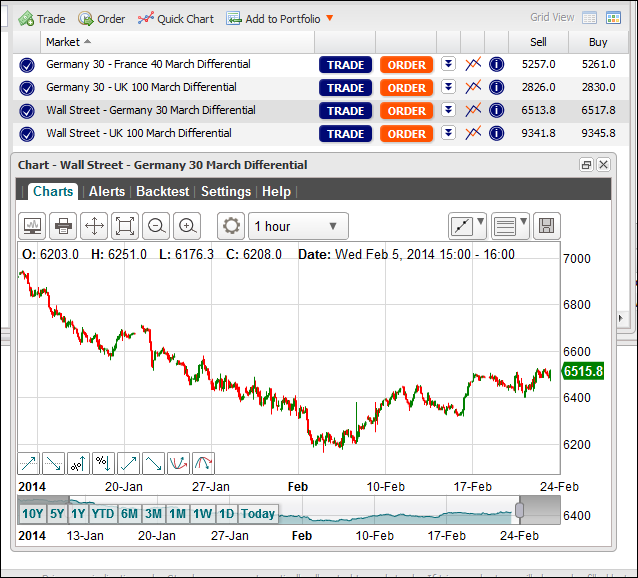 If so, the Wall Street - Germany 30 differential market might be offered at 6432.7 - 6436.7. This means that Financial Spreads clients can spread bet on the differential getting larger than 6436.7 or getting smaller than 6432.7. Why Use a Differential Market? According to Adam Jepsen, spokesman for Financial Spreads, "Individually, the Wall Street, Germany 30 and France 40 indices are some of our most popular markets. "Our existing differential markets are also rather popular so it's only natural to create more of these hybrid markets which let clients trade the relative performance of the stock indices. "These markets can be particularly useful because they mean you don't have to manage two sets of trading orders and don't have to pay twice for the spread." The above differential markets are monthly or quarterly futures markets and therefore they have a fixed expiry date. The example is based on the 'March' market which means that any positions that haven't already been closed beforehand will be closed and settled on 19 March. Nevertheless, investors do have the option of rolling a futures contract into the next month / quarter for a small fee. Based in London, Financial Spreads offers over 2,500 separate spread betting and CFD markets from one account. There are no stock broker fees and investors can speculate on a broad range of markets such as the share price of Twitter and Royal Mail. They can also trade forex markets such as EUR/USD, GBP/USD and USD/JPY as well as commodities including crude oil, gold and silver.